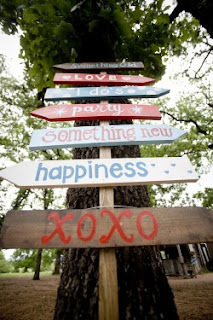 Wedding Wednesday- 31 More Good Ideas for ONE Month Out! Alright people! We are exactly one month out today! So rather than just do one great idea, I figured I would do 31. 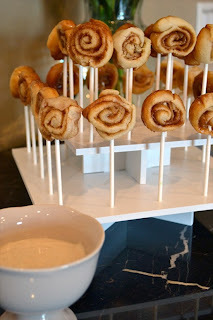 I probably won't have another chance to trot out the fun ideas I come across on my blog hopping (which is almost over too! I mean, I am watching them slowly wane from my interest- once you have made your decisions, it just isn't as fun). I especially love that Offbeat Bride, and there a couple on here that I have left at the side for quite a while. So anyway, drink this in people, because it is almost over! 1. This isn't technically only for weddings (It would be awesome for like holidays too) but for a brunch wedding it would be really cool. I can easily explain why we did our wedding the way we did (we want to dance), but if you aren't dancey, I think a brunch wedding would be so cool. 2. 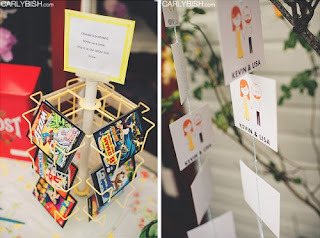 Comic book postcards as your guest book. Very cool. I especially love the way they are displaying them. 3. A Unity Sandwich! As opposed to sand or candles or that business. The Boy HATES those, but we would do this if we could. Just amazing. Lifetime commitments do look like sandwiches. 4. 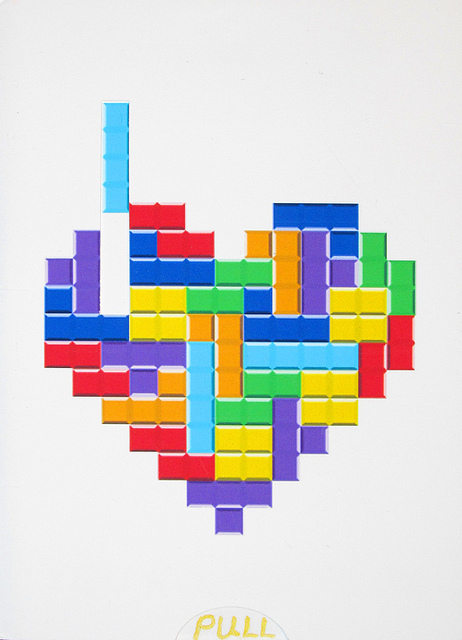 A Tetris Invite- This is Genius!! Would be very cool for a gamer wedding. 5. 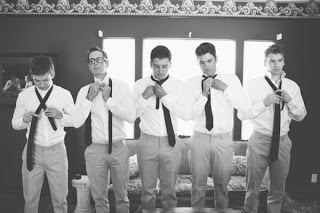 This picture of guys getting ready. I just think this is pretty sweet. 6. 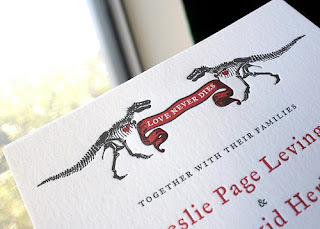 Dinosaur bone motif- I just think this is adorable- very tongue and cheek without being overly cutesy. 7. Kids packs- I like this wayyy better than the coloring books that A) they don't use and B) are usually perpetuating a bunch of heteronormative silliness. I mean, if you are at a wedding for a heterosexual couple, some of this business is hard to avoid, but I think there is no reason to treat it like the only option. Or even something they should aspire to? If you just give them notepads, they can use it however they want! 8. This. I am pretty sure this was described as "something for the groom" but I think this could be awesome for anyone! 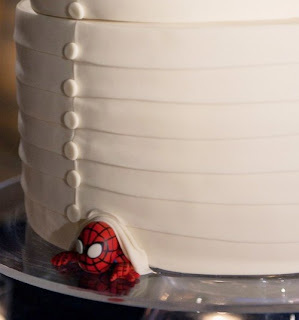 Think of all the weirdness you could have crawling out of your wedding cake! This idea truly has a ton of potential. 9. 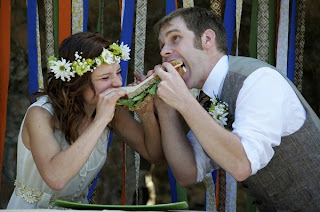 This is probably the last time I will post a picture of this wedding, the dream one, on the blog. Yet another picture of it has been circulating around the internet, and it seriously has to be the prettiest yet. 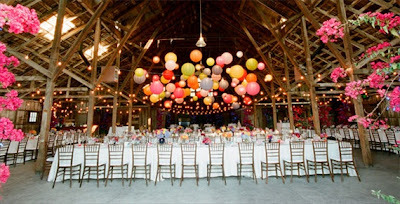 This is the reception that launched a thousand paper lanterns. Still, come on people! This is amazing! 10. 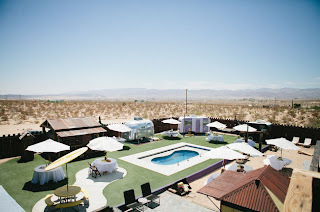 Having a wedding at the cheesy astro turf oasis in the middle of Joshua Tree. Just so creative and bizarre. I love the kind of intentional cheesiness of it all, but Joshua Tree is also so beautiful, so you get a very strange combination. 11. Bride with each bridesmaid pictures- I really love these, because they turn out so much sweeter than the big group pictures. 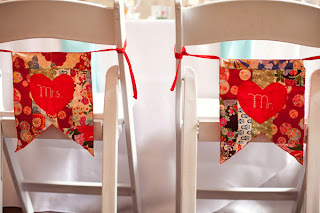 Melissa did these for her wedding, and I really thought they were great. 12. 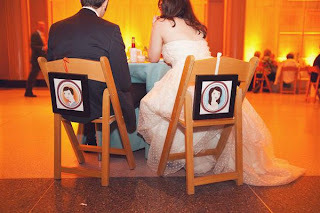 Pictures on the back of the bride and groom's chairs. I saw another one in a magazine wherre the pictures were of the bride and groom as kids. I thought that was such a sentimental idea without being saccharine or overly agressive in its cuteness. 13. Engagement pictures that prominently feature pets (and maybe nothing else)- this engagement pic is so cool because it isn't trying to hard. 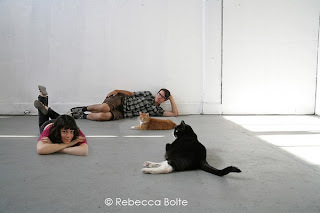 But putting them in a studio-like space, the photographer avoids some overly domesticated , Beidermeier style intimacy- but it is still intimate! 14. 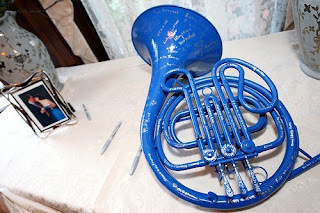 A Blue French Horn as your Guest Book- Perfect for the exceptionally avid How I Met Your Mother enthusiast (or french horn players, I guess). 15. Another great engagement picture- God Bless Neon shoe laces- also, couples which are not equally matched in their eccentricity- I totally get that! 16. 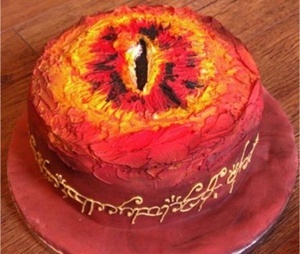 Eye of Sauron groom's cake- Wow I wish I had thought of this! THis cake is AMAZING. 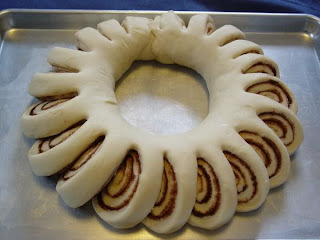 Now I just think we need to have a Lord of the Ring's themed party so I can make this cake. Just about the most evil cake ever, in a good way. Seriously, one of my girlfriends with babies needs to have a Lord of the Rings themed 1st birthday party so their kid can eat the eye of Sauron! 17. 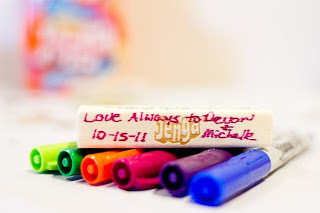 Jenga block guest book- Just, cute. 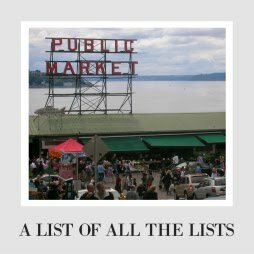 I would prefer a settlers of Cattan Guest Book. Maybe Uno. Or Pirateer. 18. Cookie Bouquet! 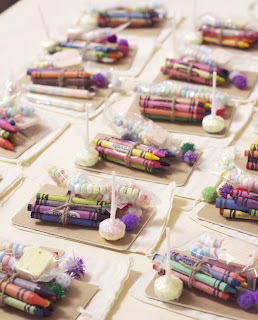 Another genius sweets-related Idea- It is so sweet and they look delicious! 19. Ok, I am not a hot pink person, but I will happily respect any person's commitment to color. The inside of this skirt is just so cute. A great way to spice up a boring white dress. 20. 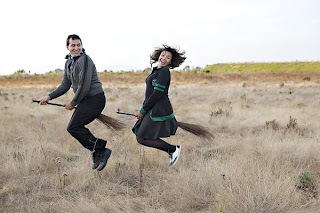 Harry Potter Engagement Pictures. This is sooooo good. This is why you can't spend too much time on blogs after a decision is done and over with. How do you live with yourself when you realize that you didn't think of a Harry Potter themed engagement shoot? 21. 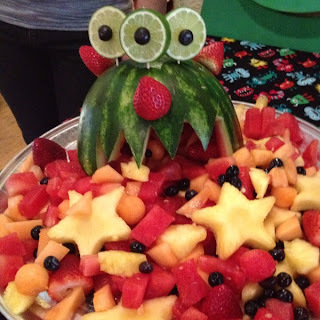 Fruit Monster- I love this guy. Way better than your regular fruit display. The three eyes and strawberry ears are my favorite part. 22. These signs. I like the mix of fonts and colors on this particular one. 24. 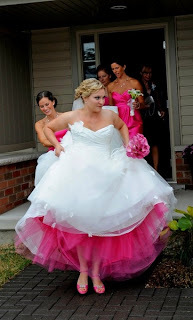 A beautiful Prego bridesmaid! I mean, I have a couple pregos in the mix, and i love the look they did for this girl! I just want them to feel cute too! 25. 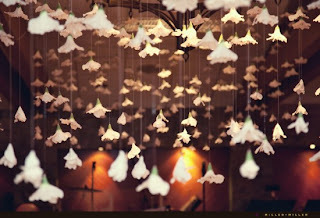 I go back and forth on loving this and thinking like it looks like a sea of hung up used tissues.My Dad's dog would love it! 26. 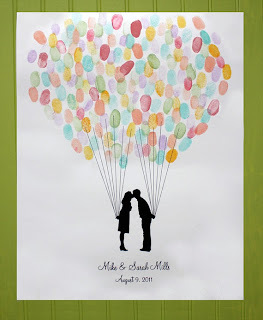 These guestbooks- Probably the Boy's favorite thing we got for the whole wedding. It's very cute! 27. 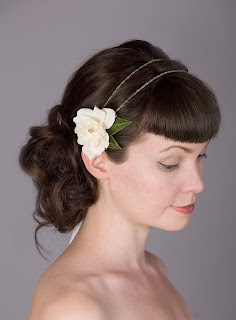 Brides with Bettie Page bangs. I miss my blunt bangs, but I hear having them for your wedding leads to all kinds of annoyances and such. Still, this girl looks adorable. 28. 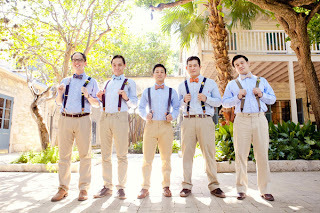 Suspenders! I love them, I love this picture, and I love the commitment of the two guys on the left. 29. 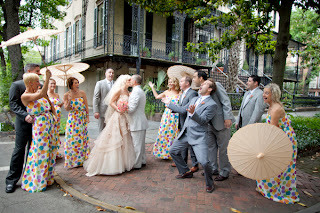 Polka dot bridesmaid dresses- I love some pattern. In Pam and Carlo's wedding, we wore black and white patterned dresses and they were so cute. 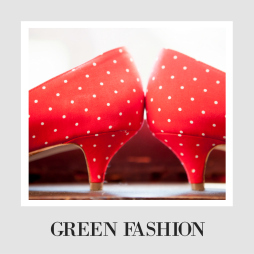 People shouldn't be afraid of patterns! 30. Quilting details. So pretty! 31. 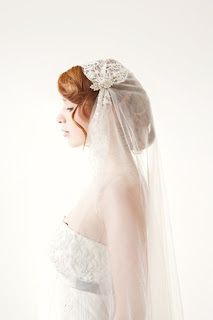 This veil. Just beautiful! Alright people!! We only have 31 days to go!! It's almost the end of Wedding Wednesday!